Dr. DeBias and the professional staff at The Institute have performed thousands of radio frequency skin tightening treatments to help patients improve their skin health and refresh their youthful skin appearance. If you’re considering how to refresh your appearance without surgery, the Pellevé Wrinkle Reduction System may be right for you. Pellevé skin tightening safely and effectively treats facial wrinkles with virtually no pain, no anesthesia, and no downtime. With just a single, one-hour treatment, you could be on your way to firmer, tighter skin—with results that can last up to six months. Medical studies have proven that Pellevé treatments are safe and effective ways to reduce the appearance of wrinkles without surgery. The side effects and discomfort are minimal, and no drugs or anesthetics are used during the procedure. 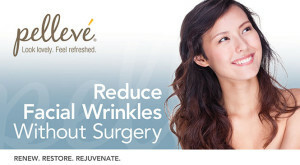 Unlike other skin tightening systems, Pellevé doesn’t require anesthesia or skin cooling. Because the skin is not numb, you can describe the depth of feeling to the doctor, which helps provide the best result in the area being treated. The overall result is a noticeable improvement in skin quality and appearance with minimal side effects and recovery time. Pellevé is virtually painless and requires no recovery time, so it fits easily into busy schedules and can provide lasting improvement up to six months. How does Pellevé treatments work? Pellevé radio frequency treatments delivers constant, gradual energy to the skin, causing heat to build up where the skin and fat layer come together. The increasing heat modifies the collagen bundles deep inside the skin, causing them to contract and stimulating the growth of new collagen over time. This results in firmer, tighter skin. How long does the Pellevé procedure take? A full facial treatment typically takes about 45 minutes to an hour. Because no anesthesia is used and any swelling is minor, there is no downtime. What should I expect during the Pellevé procedure? First, a protective gel is applied to the face. Patients say they feel a deep warming sensation when the doctor touches the area being treated with the Pellevé handpiece. No anesthetic is used, so you will act as a guide to describe the depth of the sensation as the doctor moves the handpiece across your face. Mild swelling and redness may occur, but studies have shown that this usually goes away within a few hours to a day. Many people see the result immediately after just one treatment. Additional treatments may improve results, so you should consult with your doctor for a recommended number of treatments. How long does Pellevé last? There is lasting improvement for up to six months as the skin produces new collagen. How much does Pellevé cost? First time introductory special – $295. This is well below the price of the competition! Exilis Ultra and Venus Freeze are other popular no downtime rf treatments offered at The Institute. If you are seeking the most dramatic results (safe and natural), Active FXTM is the Gold Standard for laser skin resurfacing. For patients who want more dramatic results but do not want to have more than a day or so of downtime, Venus Viva and INFINI rf microneedling skin treatments may be desirable options.